The five-year-old failed to cut much ice in four starts for Brian Meehan - but as he so often does, Michael Appleby seems to have got this one back on the right track. Saaheq won his first two starts on the turf for his current team. But it has taken him a while to get into the all-weather groove, eventually hitting the mark last time out. Involved in a tight finish that day, Saaheq looked well on top at the finish - a factor that has not gone unnoticed by the handicapper, who has inflicted a 6lb rise. Saaheq looks game for the task, though, and might not be finished improving yet. 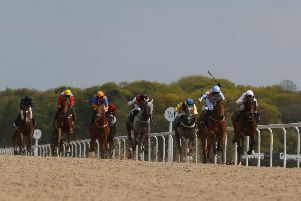 His stablemate Lion Hearted also looks set for success in the Bet toteswinger At Totesport.com Handicap. He is on a five-timer, which began with a win here back in January before a Newcastle hat-trick. Lion Hearted has been rapidly climbing the ratings - and while he is now 17lb higher, he looks capable of maintaining his run for a bit yet. Confrontational takes the eye as he makes his debut for Jennie Candlish in the sunracing.co.uk Handicap at Lingfield. Previously trained by John Murphy in Ireland, the five-year-old won his two most recent starts at Dundalk before changing hands for 27,000 guineas at the start of the month. He starts life in Britain off a mark of 83 - and given he was as high as 91 in his pomp, Confrontational could have a bit to work with. Top Power should feel the benefit of switching up to a mile and a half in the Ladbrokes Novice Stakes. He looked in need of his first attempt on the racecourse when he was pretty green, but the experience was clearly not lost on him as improved on that to be second last time. That runner-up spot came over 10 furlongs, and a further quarter-mile should not present too many issues. Aintree My Dream fell just short on his most recent outing on New Year’s Eve, but can gain compensation in the Feldon Dunsmore Budbrooke Handicap Chase at Warwick. He has yet to strike gold in three starts over fences, with more than a year off the track punctuating his first chase start in October 2017 and his return last December. A winner in point-to-point company, Aintree My Dream clearly has the ability to win a race like this. But his jumping has let him down on occasion, and Dan Skelton will surely have been putting in plenty of work on the schooling ground. Nicky Henderson sends a Cheltenham Festival possible to Exeter as Epatante contests the Visit Exeter Mares’ Novices’ Hurdle. A Grade One bumper winner in her native France, she made a victorious debut for Henderson at Kempton back in November - and the manner of her victory suggests there should be plenty more to come. The Healthy Pets Devon National Handicap Chase should prove an exacting test of stamina, and Zerachiel can rise to the occasion for Ian Williams. He was just run out of the Lincolnshire National at Market Rasen on Boxing Day, and certainly will not mind the marathon trip. CATTERICK: 1.20 For Three, 1.55 Younoso, 2.30 Groveman, 3.05 Vis A Vis, 3.35 Cloth Cap, 4.10 Dothraki Prince. CHELMSFORD: 5.45 Spring Holly, 6.15 Cappananty Con, 6.45 SAAHEQ (NAP), 7.15 San Diaco, 7.45 Lion Hearted, 8.15 Schindlers Ark. DUNDALK: 5.30 Full Moon Magic, 6.00 Yuften, 6.30 Jered Maddox, 7.00 Very Smart, 7.30 Rain Or Shine, 8.00 Magic Sea, 8.30 Ciao. 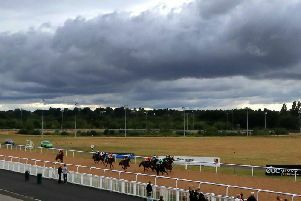 EXETER: 1.30 Printing Dollars, 2.05 Ready And Able, 2.40 Epatante, 3.10 Umbrigado, 3.45 Love Lane, 4.20 Zerachiel, 4.50 Arthurs Gift, 5.20 Eritage. LINGFIELD: 1.50 Kingi Compton, 2.25 What Will Be, 3.00 Confrontational, 3.30 Holdenhurst, 4.05 Top Power, 4.40 Music Major. WARWICK: 1.10 Angels Breath, 1.40 Praceps, 2.15 Carnspindle, 2.50 Aintree My Dream, 3.20 Tara Well, 3.55 Mahlermade, 4.30 Getariver.